We’ve been writing a lot lately about strategies and best practices for measuring performance and value with marketing attribution. Conversions can be assigned in many different ways, which can be a challenging concept to grasp for those new to attribution, or for those who have relied solely on the last click model for far too long. Due to a high demand for more information about this topic, we’ve decided to create a visual guide to help you better understand the different marketing attribution models that are available, and when/how you should use them. Reading is great, but we always find it’s much easier to learn something when you have a visual example. What are Marketing Attribution Models Anyways? Simply put, attribution models determine how credit for sales and conversions are allocated to the different touchpoints in a prospect’s journey. In most marketing platforms, the “Last Interaction” is the default model, meaning that last touchpoint before a conversion or sale happens gets 100% of the credit. This can be a fine way to measure certain channels or keywords, but often times is not the best way to get accurate results. It’s important to study your conversion paths to get an idea of the roles that your keywords, marketing channels, networks, and more play within the customer’s journey, and then assign the marketing attribution model that best fits. You can always use the Google Analytics Model Comparison Tool to compare how the different models would impact the value of your marketing channels. In the examples below, we’ll be using the same 3 marketing channels and touch points for each to keep things consistent. But remember, marketing attribution models can be used for much more than just channels. The last interaction model is the most simple, and often times the default model used by marketing and analytics platforms. It focused on that last touch point that occurred in order to make a conversion happen while ignoring everything that happened beforehand. Of course, you can view the entire journey by viewing attribution reports in many mainstream marketing platforms, but no conversion value will be given except to the final touch point. In the example above, “Direct” traffic would receive 100% of the credit, while Adwords and Facebook wouldn’t receive any recognition. This model isn’t ideal for measuring top of funnel channels or keywords that are the initial drivers of those early touch points. Another thing to note about the last interaction marketing attribution model is that it minimizes the risk of lost data. Since attribution relies on cookies for tracking, and most cookies have a window between 30 - 90 days, you run a bigger risk when using attribution models that start things earlier on. If the cookie dies before a conversion happens, it won’t have anything to assign the value to when that conversion occurs. Opposite to the “Last Interaction” model, “First Interaction” places all of the value on the first touch point. If you have multiple keywords and marketing channels that are driving those early or initial visits, this is a great model for identifying which ones are most likely to result in a conversion later on down the road. You can learn more about how we use the “First Interaction” model to identify our key initiators. In our example above, Adwords would receive 100% of the credit using the “First Interaction” marketing attribution model, while Facebook and email wouldn’t receive any conversion value whatsoever. 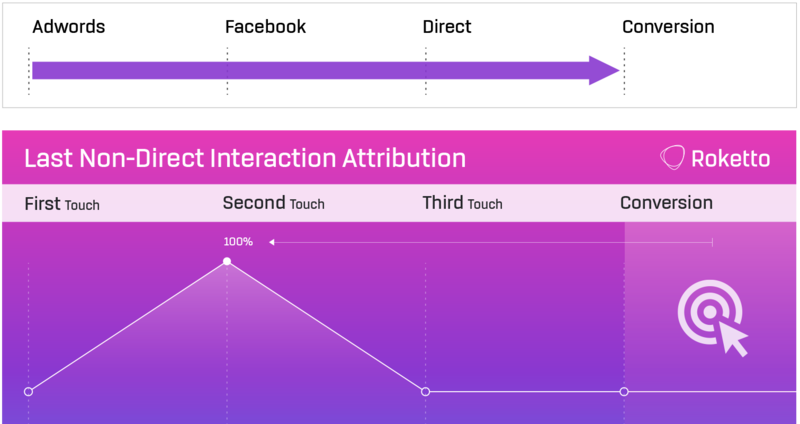 The “Last Non-Direct Interaction” attribution model is just like the “Last Interaction” model, except that direct traffic is completely ignored, and so the credit goes to the last marketing channel touch point. In our example journey above, Facebook would get 100% of the credit. 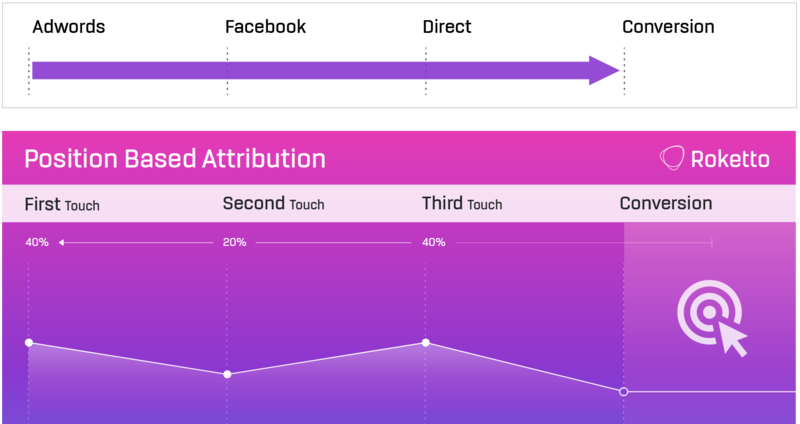 The “Linear Attribution Model” attributes credit evenly between all of the touch points. 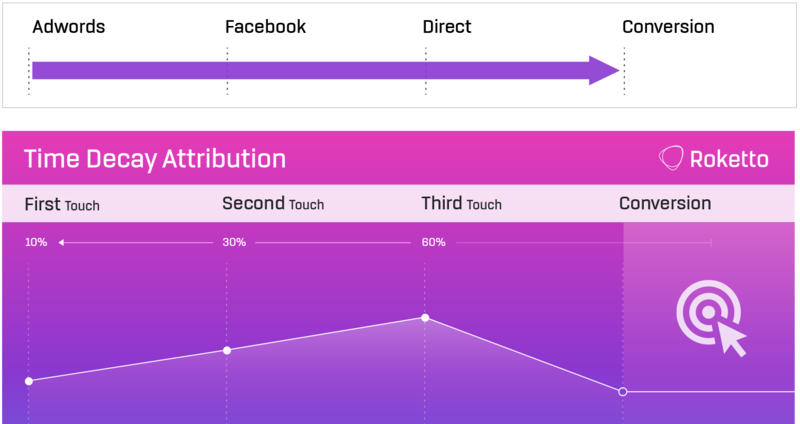 As a multi-touch attribution model, it’s the most straightforward. No matter how many touch points there are, it simply assigns credit out evenly. In our example above, Adwords, Facebook and Direct all receive the same 33% credit for the conversion. The downfall of this model is that it does not help you discern the impact of your channels. For example, let’s say someone came in through an Adwords ad, then clicked on a Facebook remarketing ad, and then returned 8 more times through direct traffic before converting. That hard-working Adwords ad that initiated everything would only receive 10% credit, where direct would receive 80%. 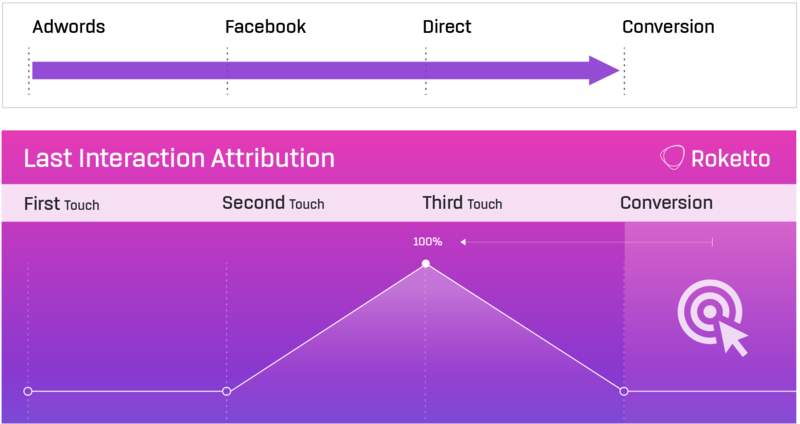 The “Position Based” attribution model is another multi-touch attribution model, but puts the majority of importance on the First and Last interactions before a conversion. 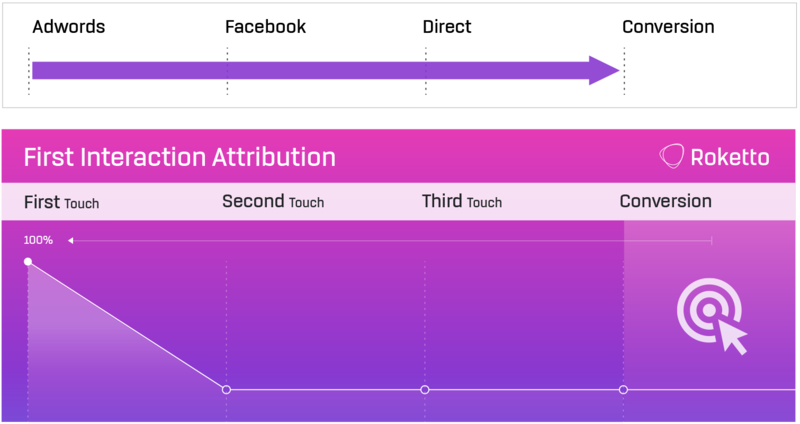 Position based attribution gives 40% credit each to the first and last interactions and splits the remaining 20% across all touch points in between. In our example above, Adwords and Direct both receive 40% each, while Facebook would receive 20%. However, let’s say there were 2 other touch points in the middle of this example, such as Referral and Email, it would look more like Facebook 6.6%, Referral 6.6%, and Email 6.6% while Adwords and Direct would remain at 40% each. A position based attribution model is ideal for marketers running lead generation campaigns, but whose responsibilities stop once that lead has been generated. The Time Decay attribution model is a multi-touch model that places recency as the focus for credit allocation. Its belief is that the closer the touchpoint is to the conversion, the stronger influence it had. For instance, if an early touchpoint happens weeks before a conversion, the conversion value would be significantly lower than touchpoints that happened days, or even hours before a conversion occurred. In our example above, the original Adwords touch points which happened a week before the conversion would only receive 10% of the conversion credit, where the Facebook ad which happened a week later received 3x that amount. The final touch point that led to the conversion received 60%. Time Decay is great for measuring your bottom of funnel touch points that are responsible for closing the conversion, while still giving some credit to the other touch points. Of course, this model is not great for providing accurate measurement for the top of funnel channels and keywords who are responsible for driving those early touch points. Now you know about the main marketing attribution models, and what they’re for, it’s time to start putting this to practical use! Need a hand? We’d love to help. Just let us know what we can do to help make your marketing campaigns more measurable and effective! Chris is our Director of Marketing here at Roketto. 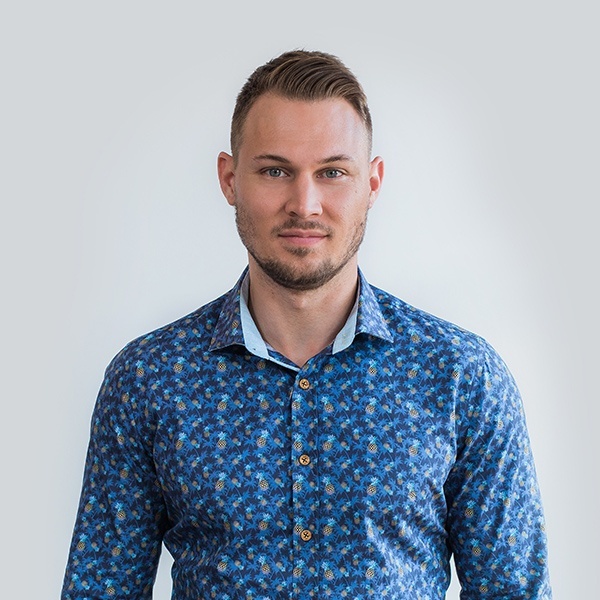 His area of expertise is digital marketing, and loves sharing and educating on topics like Adwords, CPC bidding tactics, Google Analytics, and marketing automation. When Chris isn't in the office, he enjoys playing volleyball, hitting the gym, and hanging out with his lazy dog.